We're celebrating the Cozy Days of Summer with a daily giveaway through July! Today's winner will get a copy of Dead Between the Lines by Denise Swanson. Leave a comment by midnight today -- with your email address, so Denise can reach you -- for a chance to win! Skye Denison Boyd from Denise Swanson’s New York Times bestselling Scumble River mystery series talks about her honeymoon. Hi! My name is Skye Denison Boyd. I just added that third name last night and am now ready to start my honeymoon. Back home in Scumble River, a small town in Central Illinois, I work as a school psychologist, but for the next week, my only job is to get used to being Mrs. Wally Boyd. Or as Barbara Streisand so eloquently sang, Sadie the married lady. Not that I had any doubts, but I was sure that I had chosen the right guy to marry, when he surprised me with a Caribbean cruise for our honeymoon. Not just a cruise, but a suite! Wally said that he got a really good deal because the travel agent had some sort of large group booked on this trip. Considering who I thought I saw on the staircase when we were waiting for the elevator, I sure hope our ship isn’t crawling with folks from our hometown. While I love my fellow Scumble Riverites, I don’t want to share my honeymoon with them. Still, as long as no one gets murdered, I guess the rest doesn’t matter. Just keep your fingers crossed for me that no bodies turn up. I so don’t want to be investigating a murder during my honeymoon. --New York Times bestselling author Denise Swanson writes the Scumble River and the Devereaux’s Dime Store mysteries. I enjoy Skye very much. suefoster109@netzero.net. I've never been on a cruise, or a honeymoon. i love this series!!! I love the titles you come up with!! I have not as yet read any books by this author, but I would love to—thanks for the opportunity to win! Haven't read this series yet but am anxious to give it a try. Looking forward to the new book! Another book to add to my list, unless I win it!! Her friends her mother, the house never done. When it comes to finding the murderer she's never late! Can't wait read all about the honeymoon!! Looks like a good one that I will have to add to my reading list! Honeymoon on a cruise ship = fun! Can't wait for this new book in the series! You always keep it interesting Denise! I love the cozy mysteries, and thank everyone who keeps us up to date on books coming out. I am really looking forward to reading this new venture as I have started knitting again after ten years, and I can't wait to see what happens on Skye honeymoon. Thanks for the great books and giveaways. Hi Denise. I'm a new reader to this series. I have read the first five books and love them. However, given that Skye marries Wally I guess I have a lot of catching up to do. Yay! Looking forward to reading all about Skye's honeymoon! Love to sit back and read about the latest news from Scumble River. Please keep 'em coming! Skye's honeymoon sounds interesting. Looks to be a fun read! I haven't read any of these books by this author. I will have to change that. Good luck with the honeymoon wish, but for the readers' sake, bring on the bodies! Can't wait to read more! What a tease! Love this series. Can't wait for the new book to come out. So glad they finally got married. Hello from an ASA sister. So I'm looking forward to reading the new adventure. I love Skye! Can't wait to read her latest adventure! I can't wait to read the book. I need to catch up on this fun series. Skye is one of my favorite characters - looking forward to reading about the honeymoon. Skye is one of my favorite characters and I have every single one of your books...........can't wait to read about the honeymoon!! Hope you have a lovely time! I have a feeling this is going to be one exciting honeymoon! There simply must be a murder on Skye's honeymoon. "Today's winner will get a copy of Dead Between the Lines by Denise Swanson." This is not a Scumble River book, it's a new Dime Store book. Count me in, i'm just starting this series. I love the Scumble River series and look forward to the Dime Store series. Love the Scum me River series and the Dime Store Series. Can t wait for Needled Knitter!!! I groaned out loud when I read that Skye thought she saw her mother on the cruise. Poor Skye and Wally! I can't wait to find out if the rest of the Scumble River gang are invading the honeymoon. 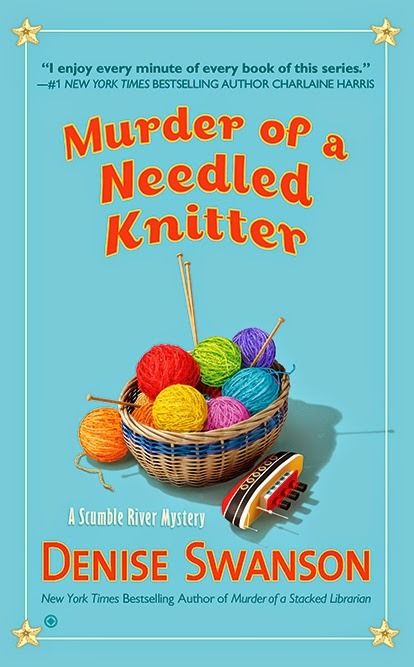 I can't wait to read your newest Scumble River cozy! Love all the characters in this series! Thank you for giving me so many wonderful hours of cozy reading! It's always fun to visit with Skye and May! Can't wait to catch up with them! Looks like an interesting series. You can never have too many books to read. Sounds good. :) Fun for the reader, even if not so much for the characters. Thank goodness for cozy mysteries especially since my latest bout of venous ulcers and then hospitalization and daily outpatient IV infusion for a terrible bacterial infection. The books kept my mind off the pain and gave me something to think about when times have been so rough these past six months. Thank you for writers of cozies and how much they give to the readers. That would be an awful way to live: always wondering when someone will recognize you. It reminded me of Sleeping with the Enemy and the JLo movie where she fights back after being on the run. These books/stories always make me extremely nervous as I read them, and I love when they end well. I love to read about women empowered. Thanks for the story!